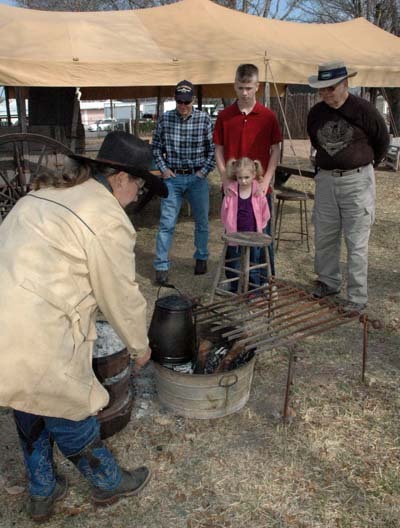 The family fun and frontier activities of Spring Break at the Pioneer Museum in Fredericksburg continue through this Saturday, March 17, 2012. Activities for all ages take place from10 a.m.to5 p.m.They include blacksmithing, spinning, quilting, butter churning, flint knapping, and rope making. Re-enactors representing Buffalo Soldiers and mountain men will share their culture and history. Kids can sit in a one-room schoolhouse, taste biscuits from an authentic chuckwagon, and make old-fashioned toys. By special arrangement, representatives of the Lakota Sioux tribe will be on hand in native regalia, with a tipi and camp set up for demonstrations and interaction. Throughout Spring Break week, the museum’s regular exhibits and buildings also will be open for viewing. Visitors can walk through one a smokehouse, blacksmith shop, and an original Sunday House. The Museum Store at 325 W. Main is also open, with a collection of history books, T-shirts, gifts, classic games and toys.